Home theater should never be anything but riveting. That goes for everyone listening to a movie, TV show, or console game – even if they’re seated way off to one side. 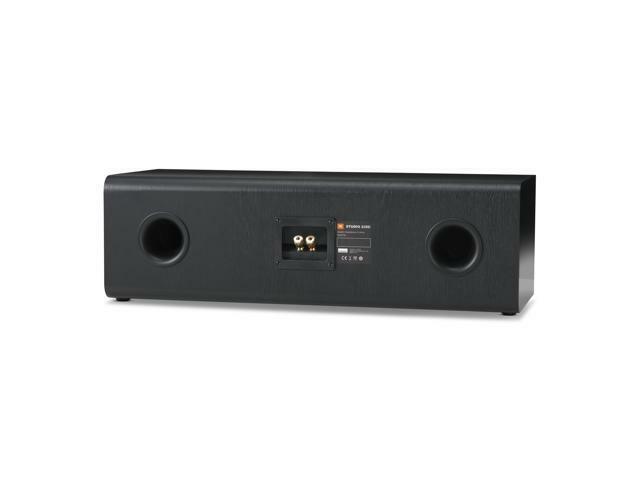 That’s why we developed the JBL® Studio 235C dual 2.5-way center channel loudspeaker. Part of the new 10-piece JBL Studio 2 loudspeaker series, the Studio 235C was built to bring depth and cinematic nuance to everything you hear on screen. Tested relentlessly in the world’s most advanced sound research lab – our own – and pitted against competitors in real world comparative listening studies, the Studio 235C wins the crown for accuracy – and then some. Its dual 6.5” PolyPlas midrange drivers accentuate the power of every word and whisper. Its rear-firing Slipstream bass port heightens your senses and deepens your appreciation with tight, accurate bass. And that’s all for starters. Taking cues from our work developing some of the world’s most legendary recording studios, we’ve given the Studio 235C the same kind of kinetic intensity you’d hear at the movies. A 1” CMMD® Lite high-frequency driver ensures low-distortion. Meanwhile, a High Definition Imaging (HDI) waveguide design offers pinpoint sound imaging and firm natural balance – whatever angle you’re listening at. To top it all off, we’ve decked out our loudspeaker with seductive 21st century features like gloss black paneling, soft rounded edges, and your choice of either Black or Espresso woodgrain finish. For those able to see and hear the truth, we’re confident you’ll know it – full volume – when you see and hear the Studio 235C.